As much as I dislike January - hello bills and miserable weather, I can't quite wrap my head around how quickly the month has passed. In three weeks it will be mid-February and of course Valentine's Day. 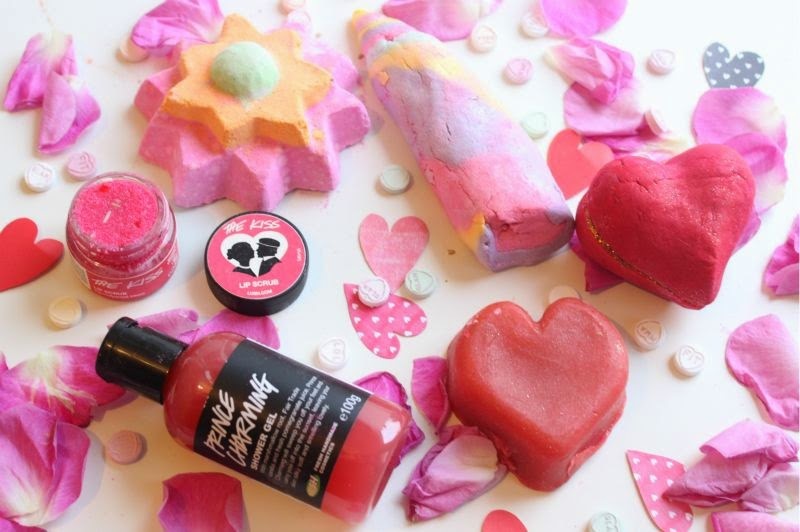 Even if you are not a fan of such occasion I do think most of us will find the newly launched Lush Valentine's Day Collection hard to resist. 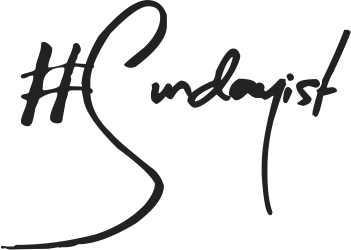 At the moment I am still trailing the products but thought a quick breakdown of scent, purpose and my initial thoughts may help those hovering over the purchase button? Isn't this beautiful? A bright multi-coloured, whimsical bubble bar in which you crumble up under running warm water to create a fountain of bubbles! If the pretty, pastel rainbow palette isn't enough to reel you in the light glitter lustre and real candy stars may grab your attention. Obviously until I use it this weekend, I can't quite say how intense the scent will be combined with water. As this is a lavender based fragrance, I would recommend this as an evening bath soak, to help soothe and calm before a peaceful nights rest. In solid form this is not your typical lavender fragrance, it almost has a certain candy like quality. I will of course post a full review once I get to enjoy this properly this coming weekend. This is the first edition of Lush Prince Charming Shower Gel in which I have enjoyed the scent. This time around it is less fruity based and more candy/vanilla in fragrance. As my bottle of Lush Snow Fairy Shower Gel is all but gone as of this morning, I will begin using this as of tonight and report back in a day or so. If you like fluffy, sweet, vanilla and/or marshmallow scents this is one I fully recommend. Isn't this pretty - almost cartoon like and a little kitsch but cute all the same. This is another bubble bar with plenty of gold glitter sparkles to liven up any bath time. Scent wise I do have to be truthful in stating that I don't care much for it - powdery yet floral. Hopefully this will liven up a little when added to warm water. I shall keep you posted! A fun, big and bright bath bomb that reminds me a lot of Granny Takes a Dip in terms of appearance. The great thing about it being so large is that you can break it into a least two pieces and enjoy several baths. This is another product that has been scented with floral oil, Jasmine Absolute to be precise. Personally I rather like the fragrance, yes it is floral but it is light and again almost "candy" like. As a serial lip biter anything that encourages me to leave my lips alone or gently removes any dead/chapped skin is always going to get a thumbs up from me. I own a good few Lush Lip Scrubs but this may be my favourites scent/taste (yes they are edible) to date. 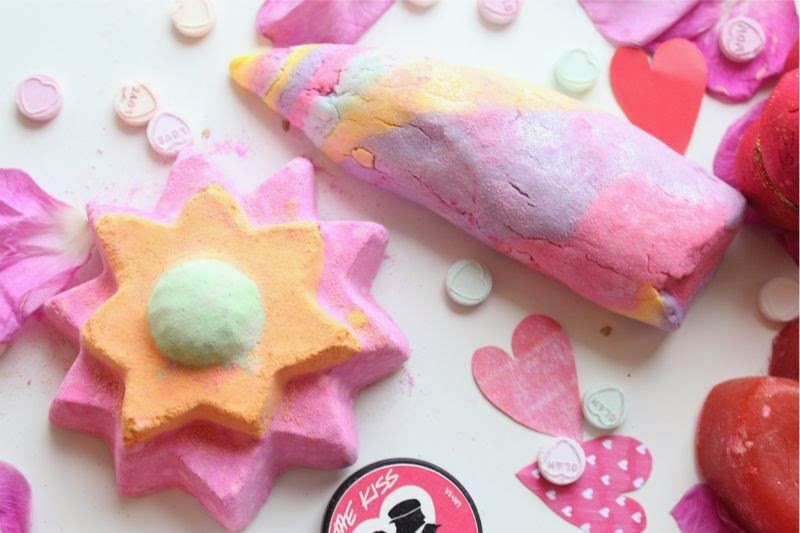 Both Lush The Kiss products (there is also a gloss) are sugary, sweet and reminiscent of sherbet (or Love Heart sweets) in scent. Lush the Kiss Lip Scrub also contains little edible hearts and real sprinkles which truthfully are more gimmicky than purposeful. 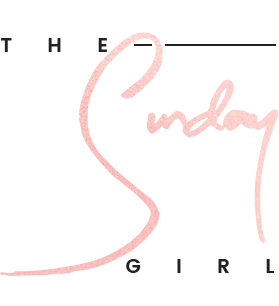 I think we call all agree it is a really pretty collection full of exciting new products. Love the look of these products, I think I will definitely try the shower gel! Lovely collection, I'm gonna check them out! 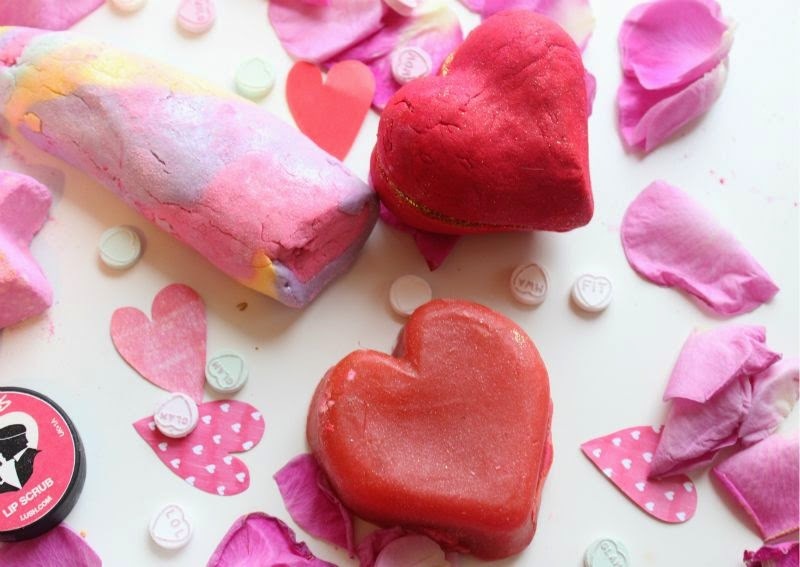 I can't wait to pick up one of the lonely hearts bath bombs and the unicorn horn. But once again Lush has created a product (or plural) that look too petty to use! Beauts. My love for the Prince Charming shower gel is insane. Literally buy so many bottles of the stuff haha!!! 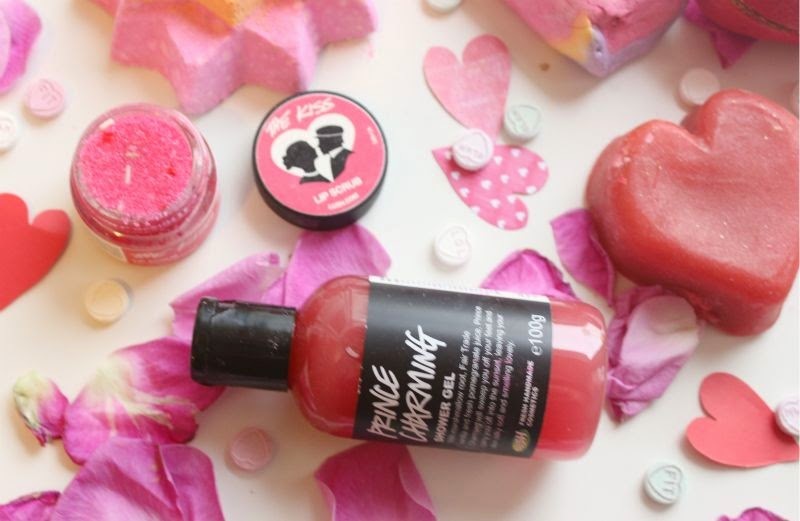 These all look super lovely.. but as I am going to be single on Valentine's Day (once again), I think I'll be buying these goodies myself :) love them! I really love the Valentine's Day collection this year and it certainly looks better than what they brought out last year!